Radar Chaos is progressing well, with an anticipated released date of April 10, 2011. This radar-based game will have ten levels in total, and will retail for $14.99. There will be a ‘lite’ version that includes two maze levels on a smaller resolution, as well as a ‘demo’ version that gives you a time-limited taste of one of the realistic levels. The lite version will be available on Facebook as well as flash game portals everywhere. The first four levels are designed with the beginner in mind. They are not easy, but the concept is straightforward for everyone. The next three levels are realistic, involving vectoring and sequencing of arrivals. The last three levels are realistic to the extent of radar procedures, but have unusual features such as deep mountain valleys, volcanic islands, and restricted airspace (I highly recommend you avoid ‘Area 51’ on level 9). You may wonder why this particular game costs more than Airport Madness 3 and the others. Radar Chaos delivers to a slightly smaller niche market of aviation enthusiasts and individuals who have an interest in radar. This entry was posted in Uncategorized on March 31, 2011 by admin. Our latest air traffic control game Radar Chaos is progressing nicely, and we should have the finished product done by early April 2011, fashionably late. There are so many features we’d love to add to Radar Chaos, but in order to deliver a product within a reasonable time frame, one must say “Enough!” at some point. We had originally planned to add some “enroute” scenarios, but have decided to release these in a future version of Radar Chaos. Check out our latest screenshot of Radar Chaos on the product page of our site. This screenshot shows level 10, the final level, which has an ‘island’ theme. Lots of airports packed close together within a cluster of islands. There is plenty of terrain to hit, as these islands are volcanic and very unforgiving. This level demands a great deal of scanning. Look for Radar Chaos next month! Below is a cute video made for us by one of our customers. Very funny! Our latest air traffic control game “Radar Chaos” was originally aiming for a release in early March. Unfortunately, we’ve missed the target. We are peddling as fast as we can, hoping to get this product out the door by the end of March, or early April. We should have some more screenshots up in a couple of days. We have changed the user interface, as can be seen in the image. Our original goal was to create something simple that did not require the issuance of an approach clearance. Pilots would intuitively know to intercept any localizer you pointed them at. Unfortunately this has caused a great deal of problems in some of our more complex levels. We have scenarios that involve overlapping localizers, as well as areas of high terrain that involve many turns prior to final approach. Allowing the pilots to exercise intelligence was leading to disaster. Originally this panel had no CANCEL or SUBMIT buttons. All the user had to do was mouse away, and the panel would close. Unfortunately, a couple of beta testers found this to be confusing. People like to have control over when things close. So here it is the control panel in it’s final form. It is very quick and easy to use. 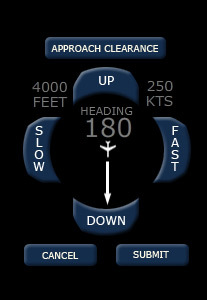 Instructions will explain how to adjust an aircrafts heading, simply by dragging the arrow to a new direction. We have no doubt that this will be a fun game, however it begs to be separated into two separate projects: a basic maze game, and a simulator. We will be packaging it as a whole, however. Radar Chaos will offer a variety of air traffic control challenges, from basic to advanced. This entry was posted in Uncategorized on March 8, 2011 by admin.